Our operation is based solely on commercial relevance which translates through the supply chain. We run our stud herd side by side with our commercial herd. Genetics used in the stud directly flow into our commercial enterprise. As you can all appreciate, the best outcome for a commercial herd on an annual basis is to have high conceptions, no calving trouble, high rebreed rate and an even line of well grown weaners to sell, grow out, or retain as future breeders. Further down the chain, in the feeding and processing segments, a product that consistently performs well is pursued and receives a premium. With consistency comes brand recognition. We have been particularly pleased in this tough season to see our bloodline being sought after by renown processors. 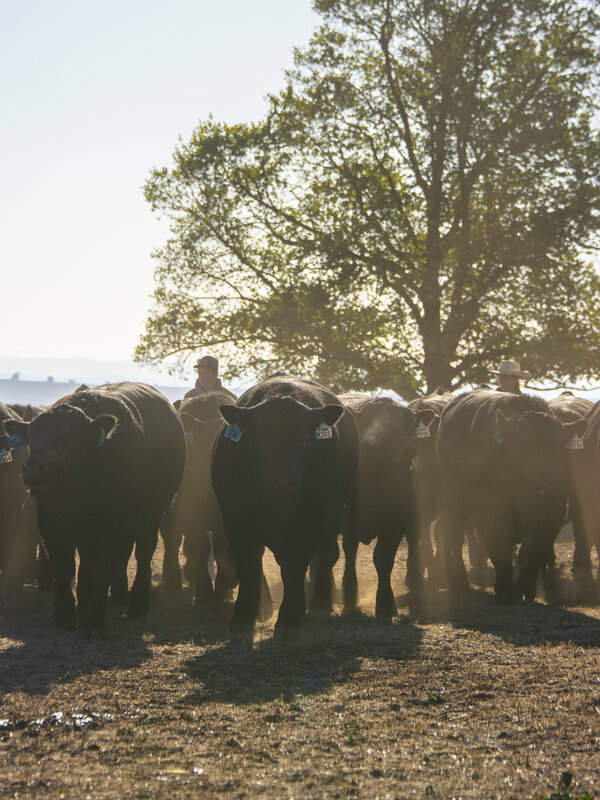 Steers from our commercial herd and those of our clients receive significant premiums with our entire drop of steers bought by Rangers Valley each year. The Hazeldean brand is consistent, reliable and relevant to commercial breeders through to processors. This year’s sale team is a great reflection of our brand. You will notice a high portion of these bulls are sired by our own Hazeldean bred bulls. Hazeldean J140 has been used heavily in the program for his structural correctness to ensure our cattle maintain functionality, longevity and docility. Hazeldean Katzen K416 is a standout for his short gestation, high growth and impressive phenotype. Hazeldean F1023 has been used significantly after his outstanding performance in the Angus Sire Benchmarking pushing him into the number one seat for IMF EBV within Angus Australia. Although these sires have their strengths they all maintain the base requirement for the Hazeldean brand of calving ease, growth, carcase, temperament and constitution. As drought grips large parts of central and western New South Wales and Queensland it is timely to remind ourselves of one of the most important traits in beef cattle production. Although droughts by their very nature give rise to negativity there are some positives to pick out of adverse seasons and the issue of doing ability is one of them. It is worth re stating the value of this important characteristic probably best described as ‘when the going gets tough, the tough get going’.